Here in Northern Sicily they love breadcrumbs. Not what you would imagine to be the Mediterranean ingredient par excellence, I know, but they pop up all over the place. Sicilians take thin strips of meat, pounded until almost translucent, and cover them with mollica condita (breadcrumbs mixed with parmesan, parsley, oil, salt and pepper. Garlic is often added, and in Palermo also sultanas and pine nuts). They then roll them up and slide them onto skewers, ready to be grilled. They do the same thing to fish (in particular scabbard fish, sardines, saury, tuna and swordfish) and to sliced vegetables (peppers, aubergines and courgettes). When not rolling things up with breadcrumbs inside, they’re using the stuff to stuff (sorry) anything which is already hollow (squid, baby peppers), or potentially so (baby aubergines, onions, tomatoes). Or they’re pushing them between the leaves of artichokes prior to steaming. Or, of course, they’re coating slices of meat, fish or vegetables in them before frying or grilling. And traditionally, back when cheese was still a luxury, they would sprinkle their pasta not with parmesan, but with… you guessed, toasted breadcrumbs (delicious, by the way – try it). Which brings us on to today’s recipe. It’s almost as if some Sicilian housewife, faced with a simple dish of greens, thought to herself “how can I get breadcrumbs in on the act here?”. Desperate, lacking inspiration, but determined to find a way, she simply threw some in the pan. The result, surprisingly, was delicious. This however, is also due to the fact that vinegar and mint are involved, two ingredients able to lift the flavour of practically anything, even breadcrumbs. 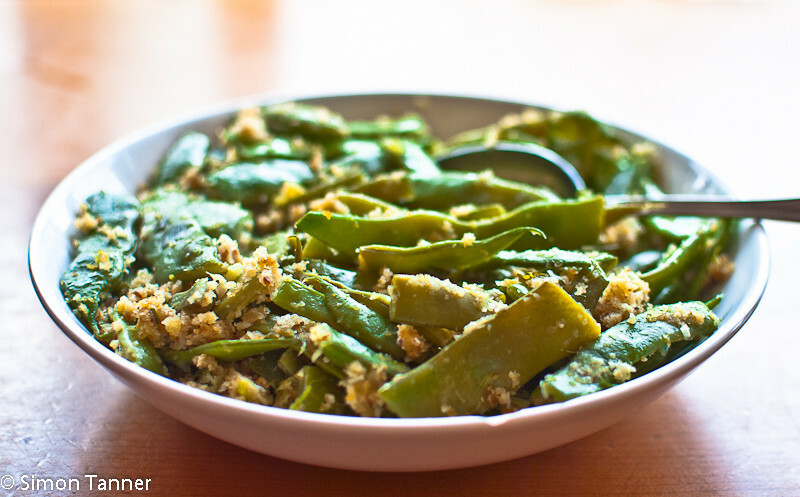 This recipe can be applied with equal success to broad beans (and this is actually the most popular version), green beans, or carrots. The beans go well with meat, fish, or a chunk of cheese. You’ll find that they’re even better the next day, when the flavours have had time to develop. Whatever you do, don’t eat them hot – you won’t be able to taste the vinegar at all and they will seem bland and boring. Gently fry the onions in some olive oil over a low heat for a couple of minutes. Add the beans and turn up the heat to medium. Stir fry for a couple of minutes to ensure the beans are well coated in oil. Season well. Add 200ml water and continue to cook over a medium heat, stirring frequently until the water has evaporated. This should take about ten minutes and coincide with the beans being cooked. If they are still too hard for your taste, add a little water at a time and continue until cooked to your taste. The important thing is that there is no water in the bottom of the pan before you proceed to the next step. Add the breadcrumbs, mint and vinegar. Stir well and continue to cook for about a minute until the vinegar evaporates. Leave to cool and eat at room temperature. This entry was posted in Recipes, Vegetables & side dishes and tagged legumes, runner beans, vegetable by hungryenglishman. Bookmark the permalink. I love breadcrumbs, naturally! As you seem to love them too, try this other combination!! Cut some peppers into bite size and place inside a baking dish. Add some finely chopped garlic, a couple of tbs of capers, a sizeable pinch or two of oregano, olive oil, salt and pepper and two or three tbs of… breadcrumbs. Mix well, then top up with some more breadcrumbs and sprinkle over with a little vinegar. Bake in a hot oven. It takes about 1 hour and you should mix half way through. Make sure you scrape up all the crunchy bits from the bottom. We fight over them! Thanks! I’ll be trying this for lunch today!